KIT OF RUBBER bands (and cups of crystal) for the trainers of paddle to create heights and areas in the track paddle. These rubber bands are ideal for building heights where to pass the ball, angles to drive the ball and window of accuracy. - 2 cups of crystal to be able to unite gums in the crystal. 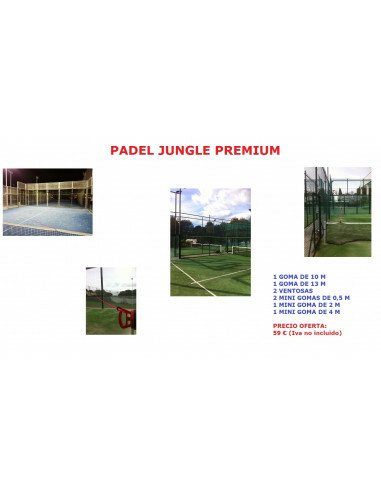 - 1 Rubber elastic of 7 metres which stretches 10 metres for horizontal distance in paddle tennis. - 1 Rubber band of 9 meters that stretches 13 metres to be able to draw the diagonals. - 2 mini-rubbers of 0.5 m to create windows, hanging of the gums horizontal. - 1 rubber 2-feet to create angles using a suction cup, and the fence or two cups or for create windows, hanging vertically on a horizontal rubber. - 1 rubber 4-feet to create angles using a suction cup, and the fence or two suction cups.